Flavourtext is for flavour only. Ladies and Gentlemen, are you feeling ludicrous today? A little loopy, perhaps? Then come one, come all, for I have just the thing for you. 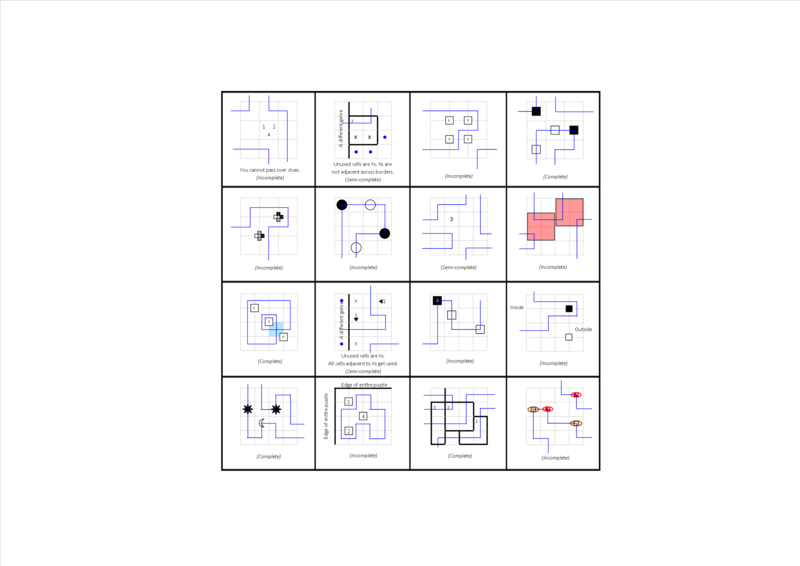 Lampreys and Jellyfish, we have here a grid deduction puzzle which has over a thousand cells of loopalicious logic. Some things may be familiar, but some will be entirely foreign, and some will be a bit of both. TAPA LIKE: The clues refer to the 8 surrounding cells (only 5 surrounding cells, if the clue is on an edge). The amount of numbers tells you how many times the loop enters the surrounding cells. The numbers tell you for exactly how many cells the loop stays in the surrounding cells each time, in no particular order. Note that these clues DO count loop segments in other 8x8 areas. COUNTRY ROAD: The loop passes through each region at most once. Unused cells in this 8x8 grid should be marked with an X. Xs cannot be adjacent over a thick line. A number tells you for how many cells the loop stays in a region. SLITHERLINK: The clues refer to the directly adjacent loop edges. The number tells you how many loop edges are adjacent to the clue. DUTCH LOOP: The loop must turn on a black square, and go straight on a white square. 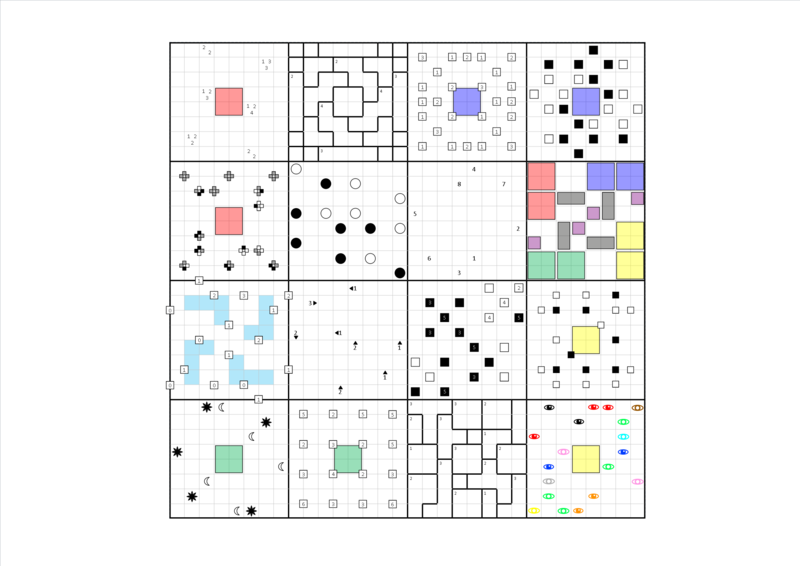 No cell may be unused in this 8x8 grid. MYOPIA: A black square points to the (possibly joint) closest loop edge, which may be in a different 8x8 region. A white square definitely doesn't point to the (possibly joint) closest loop edge. A grey square tells you no information. Note that white and grey clues can point to nothing but black clues MUST point to a loop segment. MASYU: Turn on a black circle, but go straight in the cells you visit just before and after it. Go straight over white circles, but turn in at least one of the cells visited before and after it. NURIKABE LIKE: The numbers refer to the 'island' of connected unused cells they belong to (which may extend into other regions). The number tells you how many cells the island occupies. An unused cell in this 8x8 grid MUST belong to a clued island, and there are no hidden islands in the 8x8 grid. PERSISTENCE OF ROTARY: Same coloured shapes must have the same loop pattern in them, including how it exits/enters the shape. Rotations are allowed, but no reflections. Note that not every cell has to be visited, not even the coloured ones. 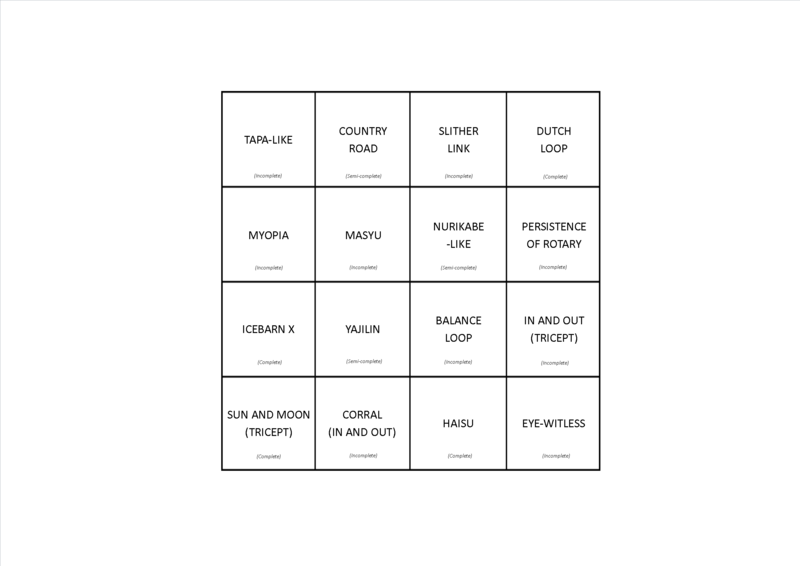 The coloured boxes in the other genres are linked to this 8x8 grid! ICEBARN X: The loop goes straight on blue cells. The loop can cross itself on blue cells. The clues tell you the smallest number of times you must cross the loop to walk from that clue to the boundary of the entire puzzle. The loop must pass at least once through every cell in the 8x8 area. YAJILIN: All unused squares should be marked with an X. Don't get confused, these are entirely independent from COUNTRY ROAD. A clue tells you how many Xs it points to within the 8x8 region. All cells adjacent to the X must be used by the loop, including cells in other regions if they are adjacent. BALANCE LOOP: The loop segments extending form a white square are of equal length. The loop segments extending from a black square are not of equal length. A number tells you the sum of the two loop segments extending from it. IN AND OUT/TRICEPT: White squares are outside the loop, black squares are inside the loop. 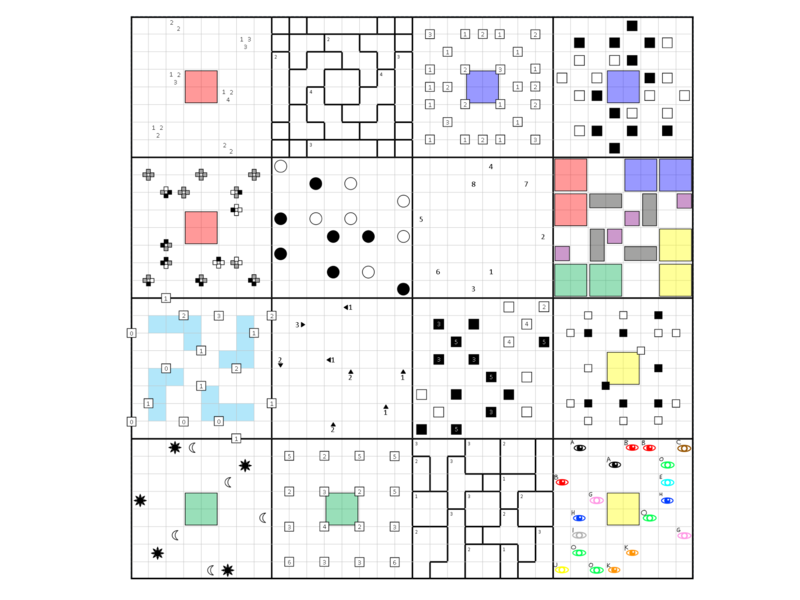 Since ICEBARN X can make 'inside' and 'outside' a bit nebulous, the formal definition is that white squares have an even ICEBARN X number, and black squares have an odd ICEBARN X number. Additionally, for any 3 cells the loop passes through consecutively, they cannot all be turns, and they cannot all be straights. SUN AND MOON/TRICEPT: The loop passes over suns and moons alternately. The loop passes through every cell. If the loop turns on a symbol, it must turn in the cells it visits before and after the symbol as well. If the loop goes straight on a symbol, it must go straight in the cells it visits before and after the symbol as well. CORRAL/IN AND OUT: The number tells you how many vertices it can see orthogonally, with its vision blocked only by loop segments. Vertices count themselves. The number does NOT count vertices on the border of the entire 32x32 grid. The number can see beyond the 8x8 grid, though. HAISU: The loop must pass through every cell in the 8x8 area. A number tells you how many times the loop enters that region. EYE-WITLESS: The loop must pass over every eye. The eyes can see along loop segments until they turn. Same coloured eyes must see the same thing; if they have full pupils, no rotation is allowed. If they have white pupils, they may see rotations of each other. 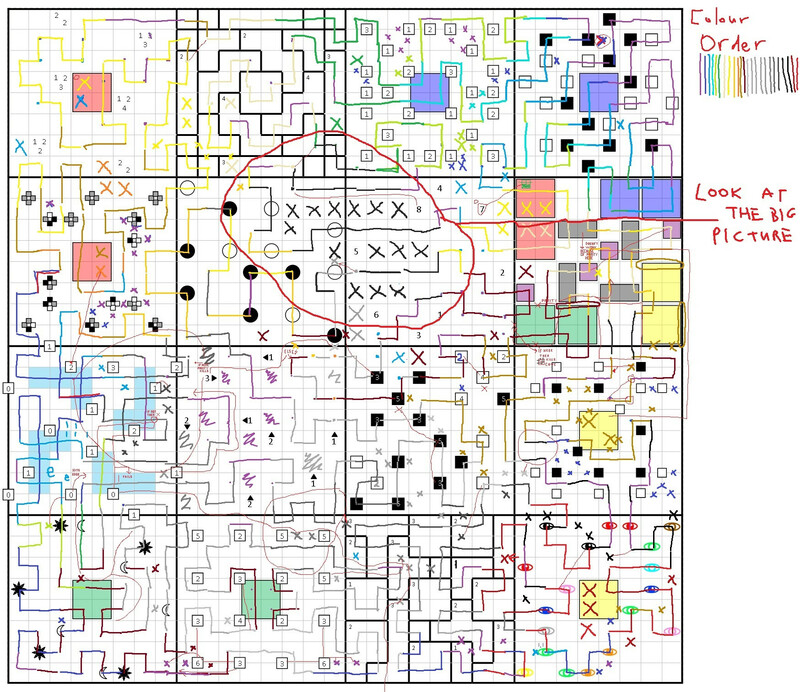 Note also that the entire 32x32 grid is ONE SINGLE PUZZLE. You are permitted to, and will have to, enter and exit 8x8 regions as many times as you need..
Lumps and Growths, I appreciate that the above wall of text might be too much to comprehend. So, have a visual explanation of the rules. Complete means pass through all cells, semi-complete means there are restrictions on the unused cells, and incomplete means no restriction. Here are the eyewitless eyes marked with letters for same colours. Plus, the lines and text were fully hand-drawn for those of you who still appreciate hand-drawn art stuff. I seriously doubt that anybody is actually going to try reconstructing my solution, but if you have any parts that you don't understand - Please have tried thoroughly though, especially with all the previous colours - just ask me below. This puzzle was well worth the effort! Very nicely done. Not the answer you're looking for? Browse other questions tagged mazes grid-deduction or ask your own question.